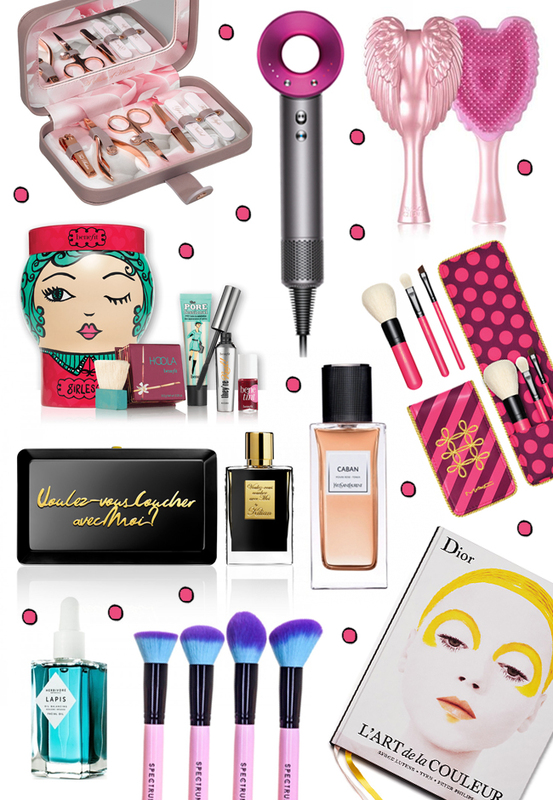 Here comes more help for gift ideas and because beauty gifts are very popular among all girls, I share my favourites with you, all freshly spotted in the shops. 1) Ted Baker Manicure Set: Spending time with doing your nails is fun with pretty tools! 2) Dyson Supersonic Hairdryer: THE beauty gift of 2016 will make eyes & hair shine alike. 3) Angel Hair Brush: The perfect brush for Barbie-lovers and kawaii girls. 4) Benefit Gift Set: Everything you need for long lashes, rosy cheeks and smooth skin. 5) Perfume Caban by YSL: The sensual aroma of pink pepper, rose & tonka bean is just wow. 6) Mac Travel Brush Set: Probably the cutest travel brush set I've ever seen. 8) Herbivore Lapis Face Oil: This oil reduces redness & clarifies the complexion. 9) Spectrum Brush Set: Because your makeup is just as good as the tools you use. 10) Book L'Art de la Colour by Dior: Get new inspiration from the best makeup artists. Not found what you are looking for here? Have a look at my gifts for the home guide.